Formula 1 bosses have decided to press ahead with the introduction of a new elimination-style qualifying system from the start of the season. 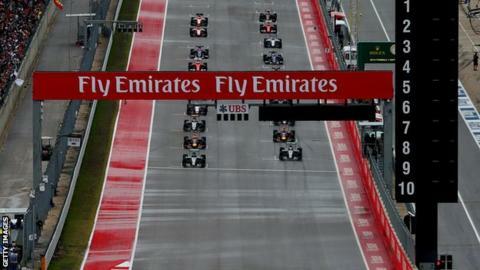 The idea was voted through unchanged on Friday by the world council of F1's governing body the FIA. It means the system will be used for the first time at the season-opening Australian Grand Prix on 19 March. The World Council has decided to ignore suggestions for tweaks to avoid an empty track at the end of qualifying. Williams team principal Claire Williams earlier confirmed it will happen in Melbourne. "The Strategy Group voted it through and I voted for it," she said. "I think it's really important to remember the whole purpose of looking at qualifying was to try and shake up the grid to go into the race and make races a little bit more exciting." The decision comes despite F1 commercial boss Bernie Ecclestone saying last week he had been told the timing software and on-screen television graphics could not be changed for the Melbourne race. Senior figures pushed back at Ecclestone on that issue, and it is understood his company, which is responsible for timing and graphics, has now said it can be done in time. "I've generally enjoyed the qualifying we had for the last few years, so that's why the changes we've made don't make sense to me in my head right now," said triple world champion Lewis Hamilton. However, the Mercedes driver said he was willing to give the changes a go, adding it would be interesting to see what the feedback was from fans. The new system will see drivers eliminated every 90 seconds in the closing minutes of each of three qualifying sessions. Seven drivers will be knocked out in the final minutes of a 16-minute first session and another seven in the final minutes of a 15-minute second session, leaving eight for a 14-minute shootout for the top positions. Many of the drivers are opposed to the change because they fear it will make qualifying too complicated for the audience to follow. There are also concerns the closing minutes of the final shootout will not be exciting because drivers may have used up their fresh tyres early on not have enough to go quicker on later on. Ferrari's Sebastian Vettel said: "I'm personally not a fan of the new qualifying and I think speaking on behalf of all the drivers, no driver is. We don't get what's wrong with the old qualifying and why they had to change it." The world council also approved new bodywork dimensions for 2017 aimed at making the cars faster and more dramatic. These include bigger tyres, wider track and wider bodywork and increased downforce through changes to the underbody. And a delay in finalising the complete 2017 rules until the end of April, without the need for unanimity among the teams, was also approved. All these changes were agreed by the F1 Commission last week.